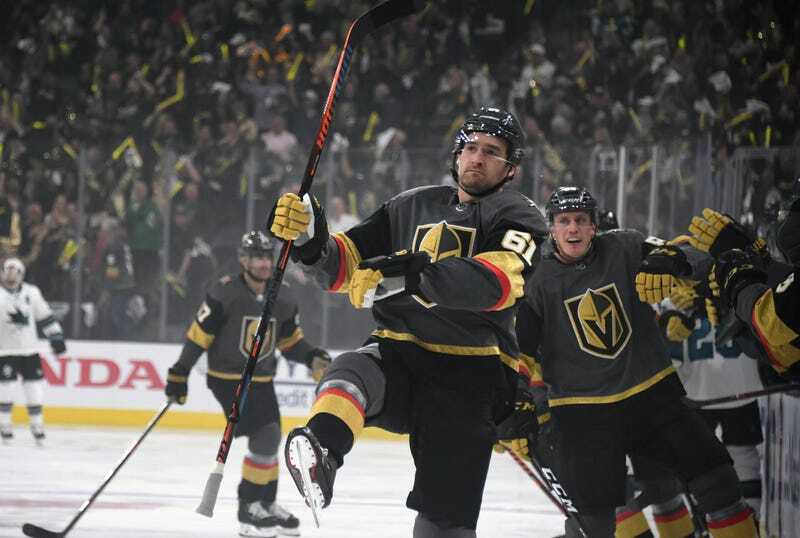 For all the things that went right for Vegas in its inaugural season last year, its second line occasionally proved a headache. The combo of James Neal, Erik Haula, and David Perron put in some goals, but was a defensive disaster—George McPhee claimed it was dead last in the league among second lines in goals against—and would have been expensive to keep together, with Neal and Perron becoming unrestricted free agents. So McPhee blew it up and built a new second line from scratch. Last summer the Golden Knights let both Neal and Perron walk, and signed Paul Stastny to center a new second line. Just before the season started, they traded for Max Pacioretty. And then, at the trade deadline, they paid a steep price for Mark Stone. All three have repaid McPhee’s faith in spades so far. The second line scored all six goals in Vegas’s 6-3 win over San Jose Sunday night to take a 2-1 series lead. Stone, who has been on fire this series, put up the franchise’s first playoff hat trick, and the first of his career. “It’s my first one, so it’s awesome,” Stone said, “but ultimately a 6-3 win in this building is better than anything I’ve ever experienced.” Vegas is a long way from Ottawa. Through three games, Stone has cemented his place as this team’s first real superstar (unless you want to count William Karlsson’s exceedingly improbable 43-goal season last year), scoring six goals and two assists. Stastny has scored a pair and added six helpers. Even Pacioretty has two goals and four assists. No other Golden Knight has more than four points. I’m not sure if it should make the Sharks feel better or worse that this line’s been performing since its inception, and the short sample size of these three games isn’t particularly misleading. Ever since they came together in February, the Pacioretty-Stastny-Stone line has been the Knights’ best—yes, even better than the top line which carried them so far last season. Which leads to something of a teleological question—just because a certain line starts a game on the ice, does it retain its label as the “first line” if the second line outperforms it and, indeed, earns more ice time? Of course, one line does not a sustainable playoff team make. “One line is not going to carry you,” coach Gerard Gallant acknowledged, even while praising his second line’s performance. “We need everybody going.” One thing that having players as red-hot as Stone and his linemates does buy Vegas, however, is time. Time for other skaters to find their games, which they’re going to need to eventually, if the Knights are going to go as deep as they did last season. Hell of a luxury, though, a second line that’s second to none.